This tool is a great addition for any serious DIY automotive technician. This scan tool offers more codes and information with more than 15,000 code definitions. It displays generic as well as manufacturer specific definitions too. 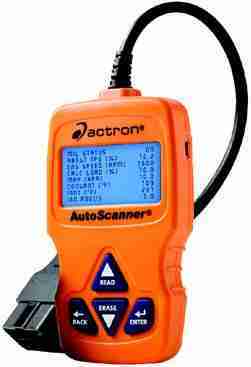 The OBD II scan tool is for all 1996 and newer vehicles and can diagnose a check engine light for your vehicle as well as estimate technician fees. Having this tool in your arsenal will allow you to tell a professional technician what’s wrong by taking advanatage of this tool’s live, real-time, professional grade data. The live data allows you to view the vehicle sensor, switch and relay inputs in real time, while the engine is running. What this really means is that you can pinpoint the problem components for faster diagnosis. This tool also displays vehicle emissions status, VIN information, freeze frame data and turns off your check engine light once repairs had been completed. You can add this tool to your arsenal for around $100; check online or at your local auto parts store to get the best price.